In a sound asset allocation framework, it is never a good idea to over weight the risky portion of the portfolio. One example would be the traditional 60/40 portfolio whereby an investor allocates 60% to equities and 40% to bonds. Such allocation may intuitively makes sense as you “feel” diversified but when extraordinary events happen, you will be less protected. Below is the performance of the 60/40 allocation rebalanced monthly since 2003. Note I used SPY and IEF for the mix. In this post, I would like to show some ideas that will reduce risk and increase return by bringing in a different type of return stream. Traditional asset allocation focuses mainly on optimal diversification of assets, here I will focus on allocation to strategies. From my own research, there are only so many asset classes the individual can choose to mix to form portfolios, not to mention the less than reliable cross correlation between assets classes in market turmoil (2008). To bring stability for the core portfolio, I will incorporate Harry Browne’s Permanent Portfolio. This return stream is composed of equal weight allocation to equities, gold, bonds. and liquid cash. For the more aggressive part, I will use daily equity mean reversion (RSI2). Note that a basic strategy overlay on an asset can produce a return stream that can have diversification benefits. Below are three different equity curves. Black, green and red represents, mean reversion, 60/40 equal weight allocation of both strategies, and permanent portfolio respectively. To summarize, I have taken two return streams derived from strategies traded over assets and combined them to form a portfolio. The allocation percentage is 40% to the risk asset (mean reversion/MR) and 60% to the conservative asset (Permanent Portfolio/PP). And here are the performance metrics. Traditional represents the traditional 60/40 allocation to equity and bonds while B-H represents buy and hold for the SP500. This superficial analysis is only meant to prove the powerful idea of equity blending of assets and trading strategies. When traditional search for diversification becomes fruitless, this idea of incorporating different strategies can have a huge impact on your underlying performance. I will come back later for the R code as its pretty late and I have class tomorrow! 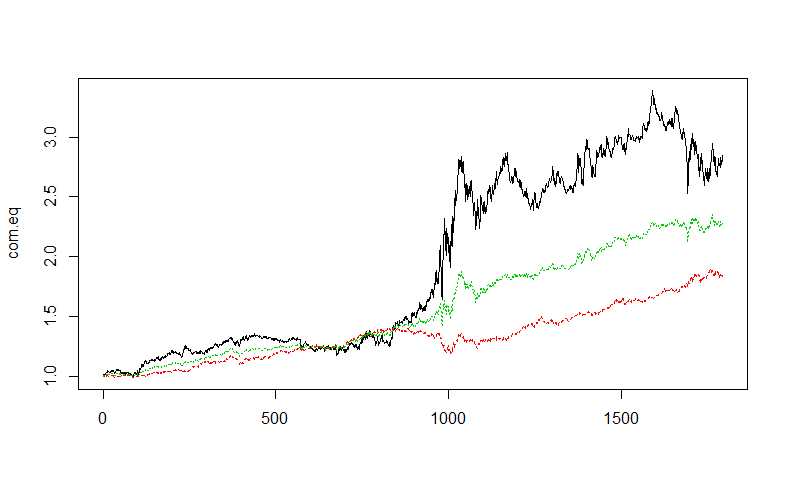 In this post, I would like to show some research I have done on the front of utilizing portfolio theory to efficiently and optimally allocate capital to a pair of systems. Traditional theory applied outright can be problematic. As I mentioned in the previous post, the assumptions that go in are not consistent in the long run, ie expected return, therefore the optimized portfolio performance will deviate significantly from backtest results. This is similar to developing a system on data that no longer reflect the current market state which will ultimately bankrupt you. In my opinion, there are ideas within the traditional framework that are useful. Expected return of individual assets may not be reliable, but expected return of a well designed system should be, in a probabilistic sense. For the past year, I started to view everything as a return streams. By this I mean rather than differentiating between assets and trading systems applied on assets, one should look at them equally. Although this may sound obvious, I will come back to this subject later and expand on it. But this way of thinking has helped me go against traditional methods of system design to built more robust systems that are model free and parameter insensitive. Their daily return correlation is 0.04. The following is their equity curve. Both of them are profitable and aren’t optimized as all. Test date is 1995-2012. Daily data are used from yahoo finance and no commissions or slippage was taken in to account. 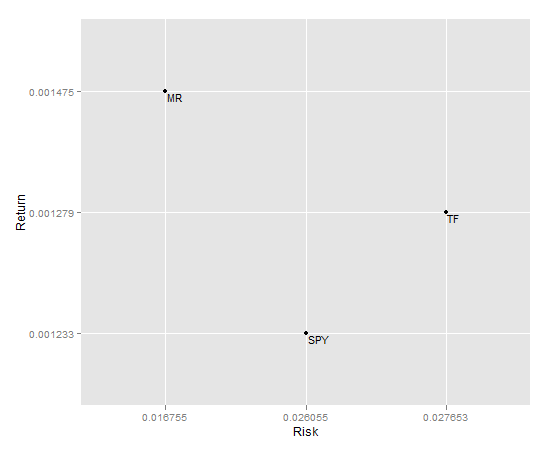 Next is their risk reward chart as popularized by traditional theory. 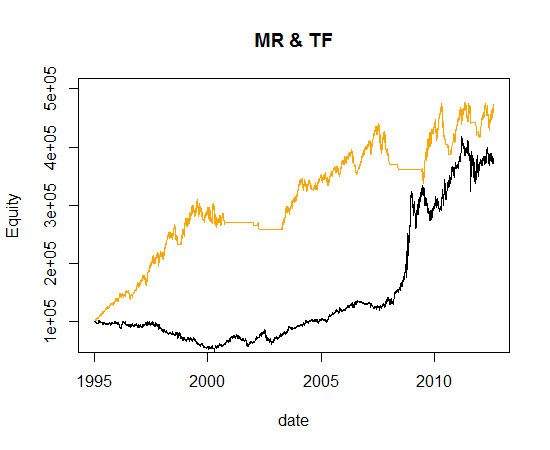 MR = Mean reversion, TF = Trend following, SPY = etf. From an asset allocation point of view, MR seems to be the most desirable of the three. 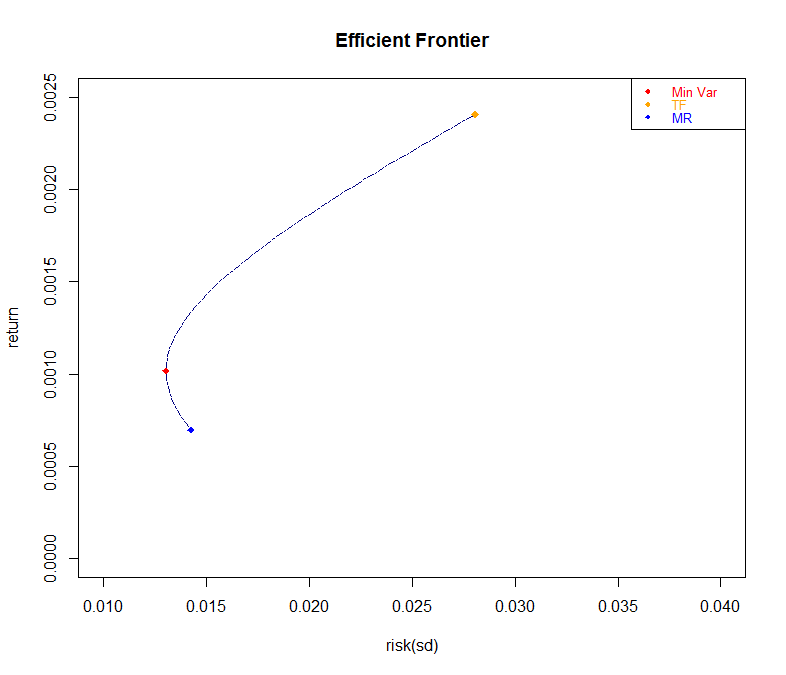 Up next I show the efficient frontier of the two systems from 2000-2004 and then based on the minimum variance (MV) allocation in that period, I will forward test it. 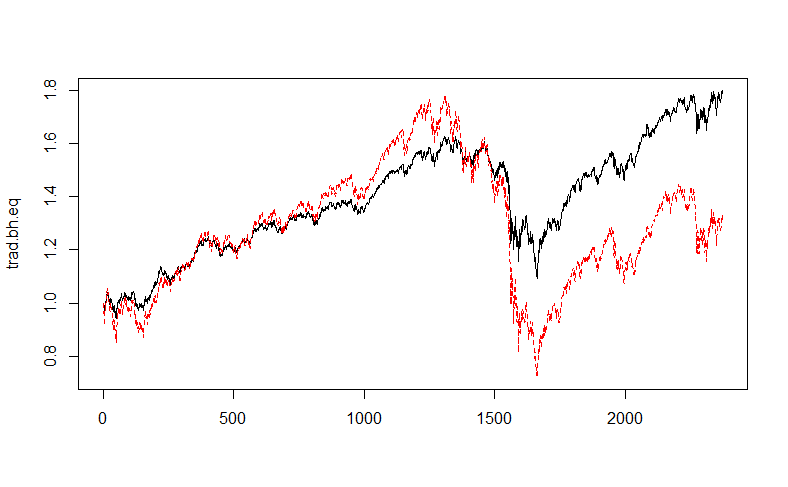 More concretely, I will compare the portfolio level equity curve from trading the two systems together. The MV allocation is the left most point on the curve. It’s the allocation that minimizes portfolio variance. 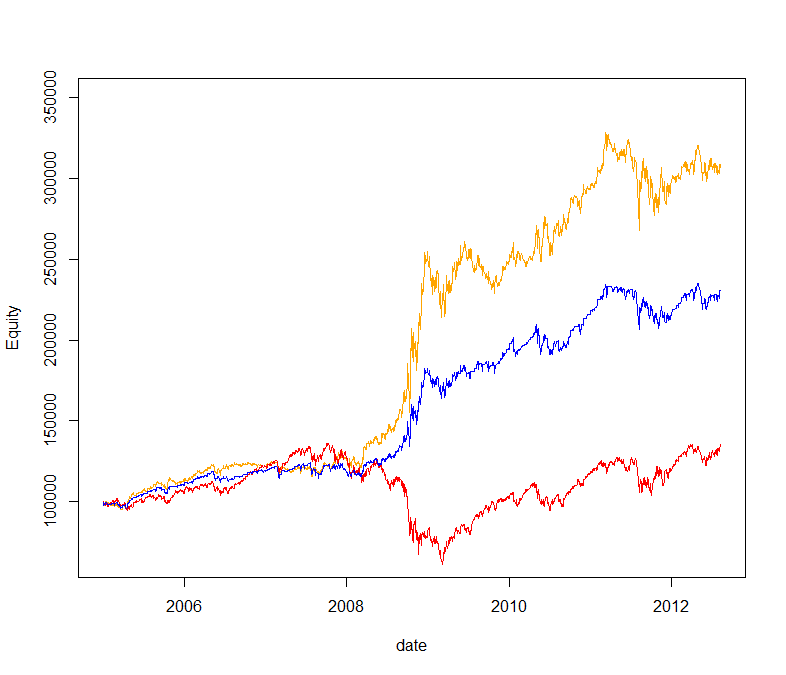 The following is the equity curves from 2005-2012 with different allocations. If I were to choose, I would go with the equal weight allocation as it has in my opinion the features that I will be able to sleep at night. I am not going to discuss the results in more depth as its well passed midnight, maybe another time I will come back and do something different. Note: the portfolio level testing was simulated using tradingblox while the optimization and plotting were done in R. If you have any questions or comments, please leave a comment below! Email me if you want the TB system files.